Opening 6-9pm First Friday, October 2, 621 Gallery will be opening the preview for the Live Auction, as well as opening the bidding for the Silent Auction! 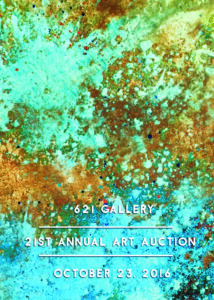 The Live Auction takes place on October 23 at 7:30pm, with a Collector’s Reception beginning at 6pm. The $35.00 entrance fee includes a bid paddle as well as heavy appetizers and refreshments. The Silent Auction bidding will run from Oct 2 at 6pm until Oct 24 at 3pm. Silent Auction Reception will be Saturday, Oct 24, 1-5pm and is Free to the Public. Gallery hours are Thursdays 1-7pm and Friday – Sunday 1-5pm. For more information, see their website or check out the 621 Gallery Facebook page!